Within the body section of a Web page, the heading acts like the headline of a newspaper, identifying the topic of sections or paragraphs for both search engines and visitors. As such, it plays an important role for search engines looking to classify the subject matter of the page. Because of this, search engines give heading text significant weight in their ranking algorithms; thus, it’s very important that you optimize headings in line with your ranking goals. As with a table of contents or outline, the heading is usually made up of short phrases, generally not complete sentences. Within the page, there are often sub-sections with their own sub-heading tag designations. Hence an H1 tag may be followed by H2 tags. The figure displays an H1 heading tag used in content. When you’re writing an H1 tag, you must include the most important keywords of that section of your Web page, which are likely to be the keywords also used in the Title and Meta tags. When seen together with the other keyword-optimized page elements, all of your page’s significant text works together to support the spiders’ recognition of your keywords as your site’s area of expertise. For this reason, you should always use at least one heading tag on every page of your site. Thanks to CSS and special CSS/Flash customization methods like scalable Inman Flash Replacement (sIFR), you can use heading tags throughout a page without ruining the design. You don’t need to use an image where you can place search engine and spider-friendly text instead. You can use multiple headings as needed, but they should always be used in hierarchical order. An H1 tag is given more weight than an H2 tag. It’s rare that there would be more than one H1 on a page because pages generally only have one major subject. All other subjects naturally fall below that top level listing. Following an H1 tag, the next heading on the page can be represented by the H2 tag. In other words, heading tags should not be used out of order. The H1 tag should be followed by the H2 tag, which can be followed by the H3 tag, if needed. Don’t use excessive headings: Too many can actually dilute the theme of your page. Think of this structure as a table of contents and you can’t go wrong. 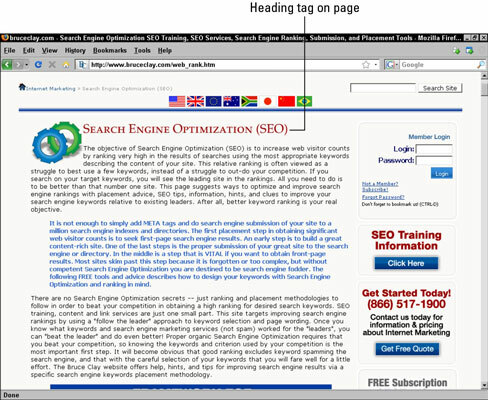 Because the purpose of the heading is to summarize the unique content of the page or section, each heading should naturally be unique as well. However, the content within a heading tag should be similar to the content in the Title because both share the task of summarizing the page content and including significant page keywords. Try to keep headings from being too long. Because they are serving as a headline for the page, headings must be concise and to the point. Notice that the heading in the figure acts as more of a title describing the subject of the page. A heading should usually be only a few targeted words and never more than a single sentence. Including an entire paragraph in a heading tag would likely be considered spam by the search engines.